This Chicken with Zucchini and Feta Recipe tastes so light and fresh, and makes an ideal low calorie, Weight Watchers dinner recipe that can be prepared quickly and easily. 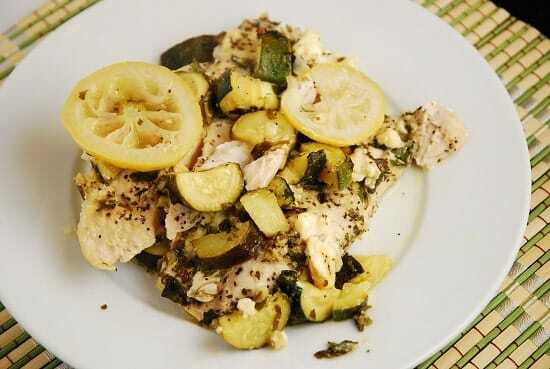 The chicken and zucchini are are flavored with garlic, lemon and oregano, and then the feta tops the dish to create a delicious balance of flavors. I also love that this healthy dinner recipe can be put together and cooked so quickly – ideal for those hectic and tiring weeknights. And each serving is just 5 Points, so you can pair this with a bread stick and a salad for a complete meal that the whole family will love. It also heats up really well the next day, so if you have any leftovers, you’ve got a great meal to take to work for lunch the next day. This Chicken with Zucchini and Feta definitely a crowd pleasing recipe that is a must try. Enjoy! A zesty and refreshing Weight Watchers dinner or lunch recipe, this Chicken with Zucchini and Feta is a real treat. The lemon and feta give this chicken a wonderful kick of flavor boost for hardly any extra calories. Spray a medium sized roasting pan or baking dish with non-fat cooking spray. Slice one lemon into thin slices and cover bottom of roasting pan with them. Sprinkle chicken breasts with salt and pepper and place them on top of lemon slices. In a medium sized bowl, toss together the zucchini, parsley, oregano, oil, garlic, and salt & pepper. Spread the zucchini mixture evenly over then chicken, then sprinkle with the feta cheese. Cover pan with foil, and make a few holes to allow for steam escape. Place in oven and cook for about 20 minutes, or until the chicken breasts are cooked through. This was amazing! My husband and I loved this. I can’t believe this is low fat! Going to make it again. The person who said “yuck!!!! !” must not know good food or how to prepare it. This dish was flavorful, fresh, satisfying, and easy to prepare. I split my chicken breasts and cooked the dish for 30 minutes. The chicken was perfectly tender. I didn’t have enough zucchini, so I added some yellow squash and fresh mushrooms. Thanks for the great recipe!!!! Made this last night and it was delicious (I used boneless thighs with all visible fat removed) It took a lot longer to cook though – 45 minutes or so and I took the foil off towards the end to brown the top. Really good with wholewheat pasta! They are raw. But they were thinly sliced, so they cooked through with no problem. If yours are a little thicker, you can leave them in a little longer until they are completely cooked.